Buttermilk is that substance that maintains life and is the foundation of nearly every recipe in the South. It runs through our veins and finds its way into almost every recipe. It is good stuff. really good stuff, although you would not have convinced me of that when I was a kid. My dad drank it. In a glass. With salt and pepper. It was not appetizing. The end. Somewhere in my adult life, when I learned to cook, buttermilk became a staple ingredient. It makes pancakes fluffier, chicken tenderer, cakes rise higher, and frosting takes on a tang. It is also really healthy stuff. Buttermilk is one of those cultured dairy products, like yogurt, that contains probiotics. The thing is – have you ever really LOOKED at the ingredients of your standard grocery store buttermilk? You know, I am pretty sure most of that never saw the interior of a cow’s udder. While most of that isn’t inherently bad – it isn’t what buttermilk used to be made of, either. Plus, it is really hard to find whole buttermilk at the store – and I really don’t like the low-fat version. So, the alternative is to make your own. It isn’t difficult and it doesn’t need any special stuff. You will need a starter and for that I just use regular buttermilk. From the store. Once you have cultured your own buttermilk you just save a cup of it to start the next batch. Eventually the culture may weaken and you will need to get a new container of buttermilk from the store and begin the process again. You can also buy starter cultures if you want to be a purist. I usually just get the stuff from the store. Bad me. Here is the thing. Whenever you are working with cultures you have to make sure that you only introduce the bacteria (culture) that you want. This means that you have to sterilize the equipment you are going to use. One more time. Always sterilize your equipment. Heat a big pot of water just to boiling and put the jar and lids in it for a few minutes. Lift it out, put it upside down on a freshly washed tea towel and let it come to room temperature. While that isn’t sterile enough for surgery it will be fine for our purposes. Now. This is my way of making it. I like a rich, creamy buttermilk. You can use all whole milk if you want. 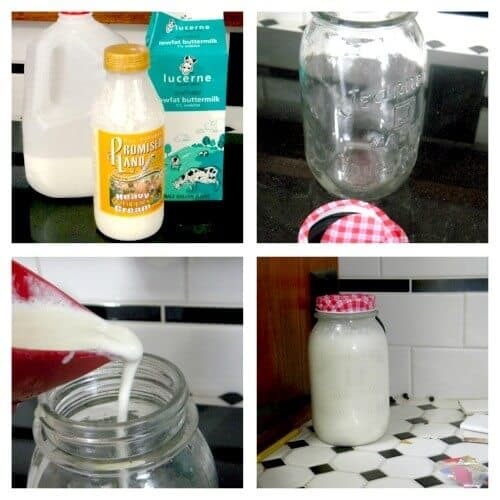 You can use raw milk. You can use lowfat milk. It’s up to you. As I said I prefer a higher fat content. Measure 2 3/4 cups of milk into the jar. After 24 hours (less if your house is warm, more if it is very cold) you should have a tangy, thick buttermilk. Use it in any recipe that calls for buttermilk but save one cup to make your next batch. Keep it tightly covered in the fridge. Easy. Unlimited. And only microscopic amounts of all that stuff that was in the commercial kind. Happy? You bet. Go make some pancakes. I want to try this and would also like to print it. I have gone over the entire article a few times and cannot find a PRINT button. There is nothing above the recipe. What am I doing wrong? Your bread recipes look amazing. Thank you. Thanks Diane – hopefully you got my emaiL? Twice it has curdled. What am I doing wrong? It is thick. When I shake it up it is curdled. You shake it when you first mix it. Don’t shake it after that. Even if it looks curdled it’s fine. Yes. 🙂 The saved buttermilk is the starter. I’m so excited to see how this turns out (it’s sitting for another 12 hours as I write this)! I do have one question, though. I made sure to boil the mason jar and lids beforehand, but should I have sterilized the measuring cups as well? Hmmm … good question. I never do… I never thought about it… but it is a good idea! When I make yogurt (also a process of culturing milk) the milk has to be heated first to prevent harmful bacteria from ruining the yogurt, this isn’t necessary for buttermilk culturing? Thanks! No it isn’t. 🙂 Do make sure your jars are sterile though. I am so excited to make this buttermilk, it is “warming” in the garage right this very minute! 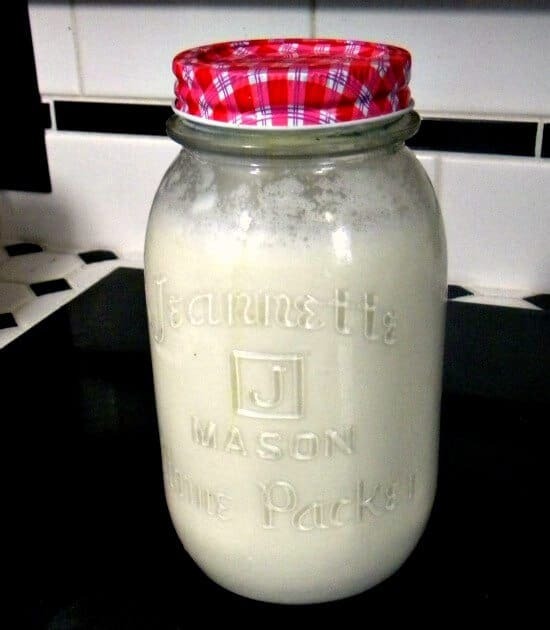 I love using whole fat buttermilk, and my husband makes his own crème fraiche which I am sure he will now be using my buttermilk instead of the one from the store. I have a white cake recipe that I LOVE to make, and I think this will only make it better. Your recipes look amazing, and I can’t wait to make the Honey Buttermilk Bread tomorrow, it is very possible it will be my new go to bread… and I love my bread recipe that I currently have. I am sorry about the auto correct misspelling of your name. Not sure how to edit the post. It is really no problem, thank you! I am totally confused. Several have asked about the additions to the 1 cup of leftover buttermilk. One person asked if she was to add the same amounts of milk and cream as the original recipe, your comment was yes. Then someone asked if they were to add the same amounts of milk, cream, and buttermilk from the original recipe, and you replied, yes. Then someone else asked if they what they were to add to the cup of buttermilk that was saved, you replied, milk or cream. Will you please republish the recipe with the amount of ingredients to add to the leftover buttermilk to keep the starter going, with complete instructions. I consider myself an experienced cook and baker, but I can’t follow the directions for the starter of the buttermilk. Sorry you’re confused. It’s quite simple. After you make the first batch you always save 1 cup of your homemade buttermilk. To that add milk+cream, milk, or cream to the same measure as the original recipe. will this buttermilk taste similar to the type from the store and can you freeze it. If you freeze it, can you still use it the same without killing the cultures. Yes, the flavor is similar or the same. I am not sure about freezing it. How long will the buttermilk last? I’m great at following instructions when it comes to recipes. I’ve succeeded in making the buttermilk. Thickened and smelled great. Just for your information I have let it sit in the fridge for 2 months and it was still great. So I’ve used the last starter cup to start the new batch and I am very well pleased. Well this might sound crazy or stupid but when I was growing up and my dad drank buttermilk it looked like it had butter in it now will this look like that. No it won’t. That was real buttermilk. Modern buttermilk is made from a culture like yogurt. Why don’t you just start with cream, churn out butter, and keep what’s left? Because it doesn’t work the same as the cultured modern type of “buttermilk”. How are you making buttermilk in this recipe if the recipe itself calls for buttermilk???? Buttermilk requires a starter. After you’ve used the small amount of commercial buttermilk for a starter you don’t have to use it again. Carageenan, while it is (red) seaweed, is extracted chemically and therefore, an irritant of the intestines in many people, and not something that I want in my food. An unnecessary ingredient in any food. The first time I made this, I followed your recipe exact and it turned out great, consistency of elmers glue & I used it in your bread recipe. Again, fantastic. I saved 1 c. of it as a starter. Yesterday I added only milk to the starter, replacing the amount of heavy cream originally used with milk as well (so 3 c. of milk total, with 1 c. starter). This morning I noticed that the liquid has seperated from the thick glue like buttermilk substance and has risen to the top. So 2 questions: Is the liquid (which has some chunks in it) that has risen to the top whey and is that safe to use for other things like “lacto-fermenting”? And second, if I just skim the liquid off is the thick buttermilk thats left okay/safe to use? Thanks! I’ve never had it do that. :/ I hesitate to give an opinion one way or another. After taking out 1 cup to start over , do I use 2and 3/4 cups of milk again and the buttermilk and cream to start over? This is what happens when fresh raw milk is left at room temperature until it curdles or “clabbers.” You can shake it up or blend it with a rotary beater and it qualifies as buttermilk. Otherwise, we country people called it whey and clabber. I do not know if just the whey part will serve as a culture. Incidentally, I am not too picky about how long it will be usable if refrigerated. I understand cheese starts out as fermented milk. Does anyone know how long the buttermilk lasts before needing a new batch? adding the other ingredients to the old starter. Should you leave the starter out on the counter for 24 hours after you have added milk and cream to make a new batch, or do you put it in the refrigerator right away. Sorry for all the questions, but I really want to make it right. Always use a clean, sterilized jar so that you only get the bacteria that you want. Leave the starter on the counter at least 12 hours, or until it thickens. Hope this helps! I’ve never done anything like this before. Is it supposed to turn out extremely thick almost with an elmers glue consistently? Or did I mess up? that’s exactly right! Sorry, I have been on vacation. I am not much of a from scratch baker or cook so Pardon if this is a silly question.Why do you use Store bought Buttermilk to MAKE buttermilk.Whats the point? The store bought buttermilk has a bacteria in it that you need for the buttermilk. You only need to use the store bought once … then from that point you use your own as a starter. Thanks for the tip on making buttermilk. I haven’t tried making it like that before. I’ve always have made it this way. 1. Combine the milk and lemon juice. Measure 1 scant cup of milk. Stir in 1 tablespoon of lemon juice or white vinegar. 3. Use the buttermilk. Use this substitute (including curdled bits) as you would buttermilk in your recipe. •	Yogurt: Mix 3/4 cup plain yogurt with 1/4 cup water to thin. Use as you would buttermilk. •	Sour Cream: Mix 3/4 cup sour cream with 1/4 cup plain water to thin. Use as you would buttermilk. •	Cream of Tartar: Mix 1 cup of milk with 1 3/4 teaspoons cream of tarter. Let stand 5-10 minutes until slightly thickened and curdled. Thanks, Cheryl, I think I would prefer this recipe. this is also how my Mom made it.